and has forgotten her own name. this afternoon after days upon days of rain and whipping wind. and I am super glued to the floor. I ask him if it's just too cold to play outside. "Not if you keep moving, mom," he says in between gulps. "If you keep moving it gets warmer and warmer." He shuts the door, cuts off the cold of a stuck-in-winter spring and runs off into the yard. 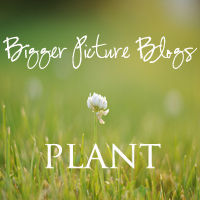 We're sharing Everyday Poetry over at Bigger Picture Blogs every Monday in April. Join us. ((hugs)) Yes, just keep moving, one step at a time. And keep your eyes looking up - He will lead the way. I've been wanting to write something to you all day - but it's been a day. This is a new favorite for me of all you've written. There are so many layers - from the weather, to seeing things/living through the eyes of children, to working through things emotionally...to faith and taking that step. It's a really lovely piece. And the first two lines just slayed me!